Home > Economics help blog > economics > The Biggest Lie in British Politics? The Biggest Lie in British Politics? Let’s start with a fact that should be on billboards across the land. 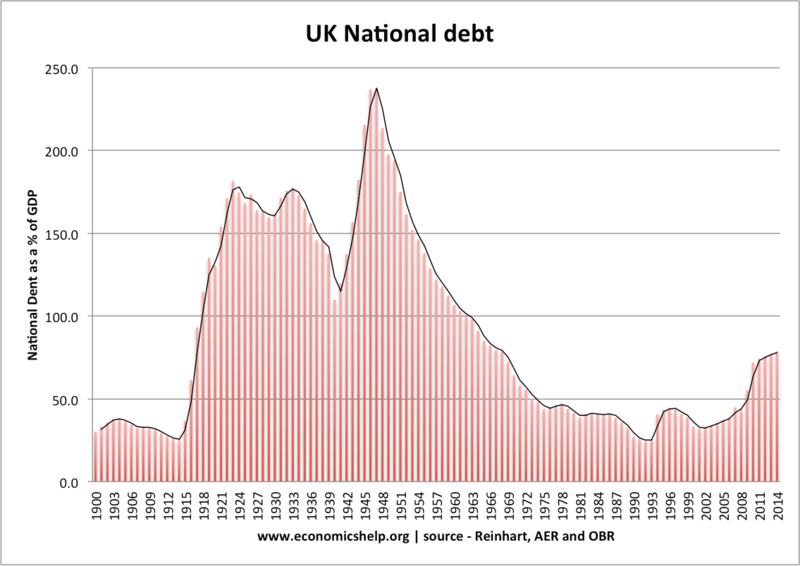 As a proportion of GDP, Britain’s national debt has been higher than it is now for 200 of the past 250 years. Read that sentence again. Check it on any graph by any historian. Since 1750, there have only been two brief 30-year periods when our debt has been lower than it is now. So we can afford to run a deficit, if that has a positive effect – which we’ll get to in a minute. If we are “bust” today, as George Osborne has claimed, then we have almost always been bust. We were bust when we pioneered the Industrial Revolution. We were bust when we ruled a quarter of the world. We were bust when we beat the Nazis. We were bust when we built the NHS. Or is it George Osborne’s economics that are bust? To what extent is this view of UK debt correct? 1. National Debt as a % of GDP is low by historical standards. Firstly, using the ONS statistics for Public sector debt, it is correct. 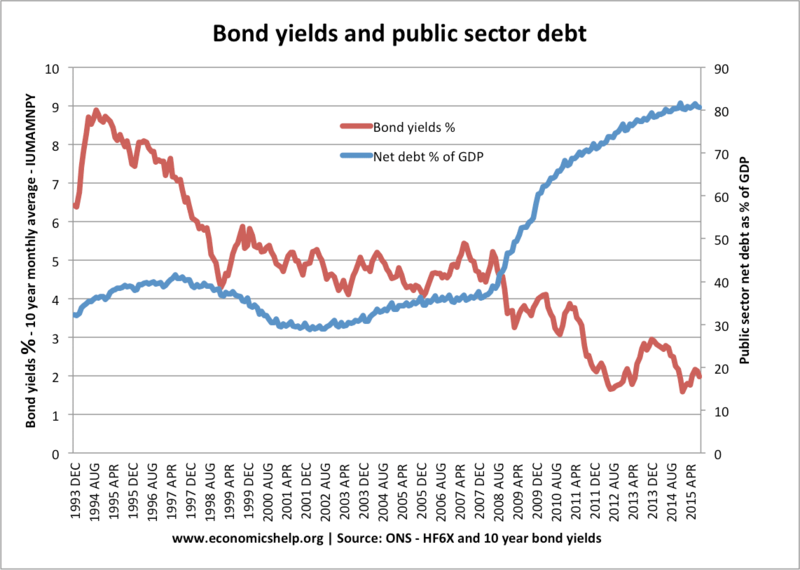 The article was written in 2011 – which was UK public sector debt has been much higher in the past. 2. Some countries do Have Higher National Debt without causing problems to bond markets. Japan does have a seemingly very large national debt at over 220% of GDP. 3. The UK has a longer maturity date on Bonds. What this means is that the average date until maturation is longer in the UK. This means there is less pressure to refinance UK debt. High levels of borrowing – did not cause bond yields to rise – in fact, they fell. When considering the fiscal position of the government, it is not just a matter of total public sector debt. It is also important to consider the annual budget deficit. (think of it like the amount national debt increases by each year). Thus, although total debt is relatively low, the annual budget deficit is high (around 11% of GDP). This is the highest peacetime level in government borrowing. Markets will be more worried because the rate of increase in national debt is fast. This will tend to make markets more nervous of future UK prospects. The headline figure of 58% of GDP, masks some other issues. Firstly, it excludes financial sector intervention. With financial sector intervention, the level of public sector debt is 149% (UK Debt) This sounds bad, but the banks have shown an increase in profitability and their shares have improved as a result. There is a good chance the government will recover all the bank bailouts. They could even make a profit on this. The centre for fiscal policy studies suggests real national debt is actually 240% of GDP. They calculate future pension liabilities as being part of national debt. But, to me, that is not real national debt. It is future costs and not costs the government have to pay. It includes future costs but makes no allowance for future revenues / economic growth. Also, plans to raise retirement age could change future pension costs. (PDF at Centre for Fiscal studies) In the post-war period, the UK has always had pension liabilities so if you start including pension liabilities all past levels of debt would have to be changed too. The European bond market is nervous. This could make it more difficult for the UK to borrow heavily. 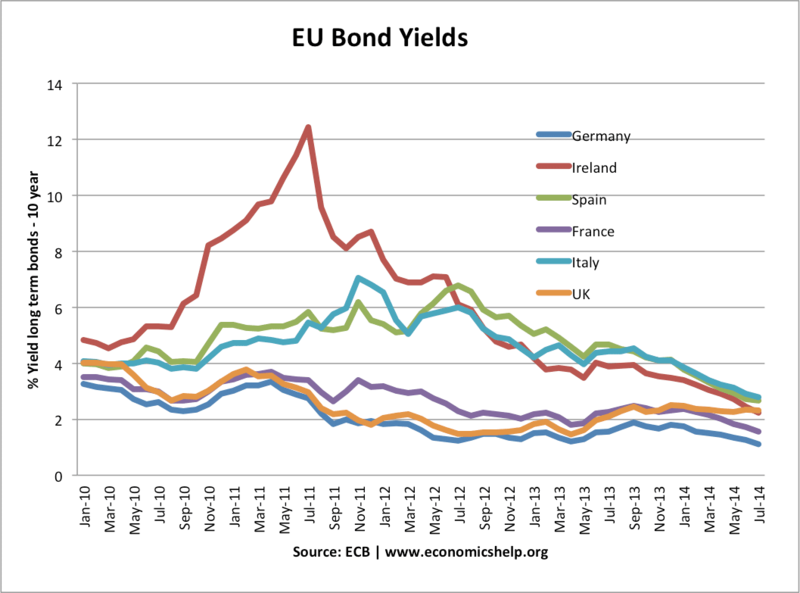 Though the Difficulties of the Eurozone stem from the lack of Central Bank willing to intervene in bond market. 5. Historical Comparisons not Perfect. Therefore I feel it would be more difficult to borrow post-war levels in the current economic climate. The UK debt crisis is definitely exaggerated. Yet, there also has been a sharp deterioration in public finances which is due to both structural and cyclical factors. These need long term solutions to reduce structural deficit. It is a simplification to say debt is only 58% of GDP and this is only issue. 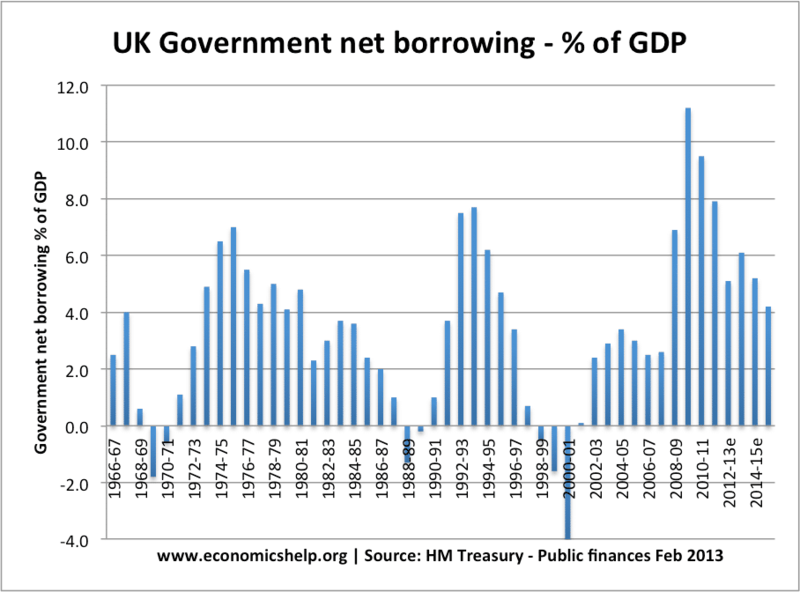 The government do the right thing to borrow more in a recession. It is textbook Keynesian economics – austerity damages prospects for growth. If growth is sluggish or low, it will be much more difficult to reduce debt to GDP ratio (see: Ireland and Greece). High growth will make any debt reduction plan much easier. The irony is that sharp spending cuts to tackle the deficit can lead to fall in GDP and increase debt to GDP ratio. Originally published 14 April 2011. Updated 12 January 2018. Hari is an idiot – best ignored (most do). He’s a bag carrier for that tireless student activist Ed Milliband. An interesting article, unlike that from Hari who is, to judge from his newspaper articles, clearly very anti-Tory and prone to sound off against current Government policy, no matter what that policy might be. Rather boorish of the man, one who seems to lack objectiveness. Just wanted to say, I don’t really see why supporting one political party less than others means you lack objectiveness. Perhaps it is less deserving? This is a matter primarily of economic viewpoints and political choice. The fact that someone might use that to come to a political conclusion does not mean that they are being less objective than you or I? Brilliant piece on debt and defcit: brief, focussed and yet comprehensive. About pensions, the acturial value of future liabilities should be considered as debt, even if these are to met by future cashflos because pre-empted portion of future revenues to meet pension payment cash outflows are real debt. Debt-GDP ratio should reflect that. Also, bailout portion of the deficit should also be accounted for after adjusting for a charge on the projected future profitability of banks as assessed currently. on debt, and the manner of atributing blame does nothing towards clear thinking and good government, or to helping the understanding of the voters. Thank you. A helpful article. On the subject of debt during war time: you mentioned war bonds bought as a patriotic duty. Would this have been the same in WW1? Should that source of funding not be (partially) discounted when evaluating the current debt burden since the same type of bond is not now available? If so, how does that change our overall evaluation? The elepant … no, the blue whale in the room here is Public Sector Unfunded Pension liability, and sitting next to it is the mere elephant that is PFI. And it is no good saying that these “are not real debt”. If its not real debt then we dont have to pay it as far as I am concerned. That after all is the definition of debt. But we DO have to pay it matey, so it IS debt and should be added to the debt figures. And if you do that, you will see that our national debt has increased steadily since WW2 as, with the creation of the Welfare State in 1947, the size and scope of state spending and state liabilities has spiralled steadily. And in particular it has rocketed since 2001 when Gordon turned on the spending taps and grew the number of state employees by nearly 30%, all with nice comfy index-linked unfunded pensions. But none of this debt appears in the article above because “to me, that is not real national debt”. Good reason? Good grief. Martin C – you don’t understand economics. If you had a £100k mortgage, with £1K/month repayments, the £1K is your monthly outgoing – or your monthly debt. If you earn £2K/month your debt is still £1K, but you are in the black by £1K/month – and not in the red by £99K. If your income drops to £800/month, you have a deficit of £200/month – but your debt is still £1K/month. You are now £200 short of meeting your debt, not £99800 short. We cannot go to the government and say we want our lifetimes pension now, and contractually, the PFI partners cannot say they want all of their investment back now. Whilst the country’s ‘tota’l debt is higher than than it’s outgoing, it’s only the outgoing that has to met. The pension liabilities are to be met over time in the future, the same as the tax revenues that will collected in this period,so the bottom line is if growth is good these liabilities could be met without borrowing. With this in mind it is correct not to class such liabilities as debt because the revenues are going forward are unknown. Correct and it should be noted they are not index linked. They are based on final salary. When you leave that salary is increased by the annual cost of living increases. Now remember that there has been a pay freeze for many years and you can see that the golf plate is starting to flake off. Add to that the government has also put back retirement age for my age group twice I have had about 30k taken away from my pension payout without accounting for the lack of pay increases. I’m waiting on the government to say they are retrospectively chaninging them to bee career average and that’s me poor in retirement. Anyone know if it is still true that £120bn is lost through tax avoidance/evasion. Also what are the negatives to the Robin Hood Tax that has been suggested and is it akin to the suggested European transaction tax? Ok, the reason that the debt (however you want to calculate it) is ‘too high’ now relative to historical position is that the UK does not have any ‘easy’ way of improving its finances. Little manufacturing, importing more than exporting, pressure on spending (age demographics) always increasing. And a Major segment of UK taxes is made from the City – which is just gambling not creating wealth (& therefore commonsense will tell us is transitory and will eventually collapse). In the past we always traded out of the debt and the economy naturally grew with massive population growth – this is simply not an option now. Interesting article which puts some things into a bit more perspective, however many costs have been left out. e.g increased welfare costs, increased NHS costs, increased inflation. There is a quote that the 8th wonder of the world is exponential interest…well the 9th wonder is exponential debt. And while they are on divergent paths then the only ending can be ruin. I am preparing for complete collapse of the europeen economy. I have stored food and have a bunker.